"Down to the Waterline" / "Water of Love"
Dire Straits is the debut studio album by the British rock band Dire Straits released on 7 October 1978 by Vertigo Records internationally and by Warner Bros. Records in the United States. The album produced the hit single "Sultans of Swing", which reached #4 on the Billboard Hot 100 chart and number 8 on the UK Singles Chart. The album reached #1 on album charts in Germany, Australia and France, #2 in the United States and #5 in the United Kingdom. Dire Straits was later certified double-platinum in both the United States and the United Kingdom. Dire Straits came about through a musical collaboration between Mark and David Knopfler. After graduating from college with a degree in English, Mark Knopfler took a job writing for the Yorkshire Evening Post. Wanting to pursue a career in music, he took a teaching position at Loughton College while playing music at night, performing with pub bands around town, including Brewer's Droop and Cafe Racers. Following his divorce and struggling financially, Knopfler moved into his brother David's flat, where John Illsley also lived. In 1977, Mark, John, and David decided to form a band. They recruited drummer Pick Withers and began rehearsing. A friend of Mark's helped give the group their name, a reference to their financial situation. After a few months of rehearsals, the band borrowed enough money to record a five-song demo tape, which included the song "Sultans of Swing." They took the tape to disc jockey Charlie Gillett, who had a radio show called "Honky Tonk" on BBC Radio London. The band respected Gillett and sought out his advice. Gillett liked what he heard and started playing "Sultans of Swing" on his show. Two months later, Dire Straits signed a recording contract with the Vertigo Records division of Phonogram Inc. Dire Straits was recorded at Basing Street Studios in London from 13 February to 5 March 1978. Knopfler used a few guitars for the recording, including a pair of red Fender Stratocasters—one from 1961 (serial number 68354) and one from 1962 (serial number 80470). He played his 1938 National Style O 14 fret guitar (serial number B1844)[Note 1] on "Water of Love" and "Wild West End." He also used a black Telecaster Thinline (serial number 226254) on "Setting Me Up". David played a black Fender Stratocaster and a Harmony Sovereign acoustic guitar. The album was produced by Muff Winwood, and engineered by Rhett Davies. The single "Sultans of Swing" first broke into the United States top five early in the spring of 1979—being a hit a full five months after the album was released there—and then rose to number eight on the British charts. "Water of Love" was also released as a single in some countries, and charted in Australia, reaching number 54, and in the Netherlands, reaching number 28. In Europe, the album sold four million copies, and in the United States, it sold two million copies. 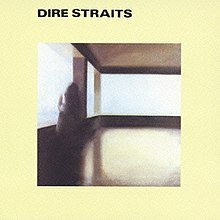 The album was remastered and released with the rest of the Dire Straits catalogue in 1996 to most of the world excluding the U.S. and on 19 September 2000 in the United States. The album cover artwork is taken from a painting by Chuck Loyola. The Dire Straits Fender logo, which appears on the back cover, was designed by Geoff Halpern. Dire Straits promoted the release of their first single and album with the Dire Straits Tour, which started on 6 June 1978 at the Lafayette Club in Wolverhampton, included 55 shows, and ending on 18 November 1978 at the College of Education in Hitchin. The European tour included concerts in the United Kingdom, France, Belgium, Germany, and the Netherlands. These concerts presented Dire Straits with their largest audiences to date. The first leg of the tour promoted their first single, "Sultans of Swing". This first leg took the band around Great Britain in June and July 1978, performing in England, Scotland, and Wales. The group typically performed in small halls with a maximum capacity of one thousand. The second leg of the tour promoted the band's debut album. This leg took the band to several European countries, where they met journalists and performed on television programs. In a retrospective review for AllMusic, Stephen Thomas Erlewine gave the album four out of five stars, calling it "remarkably accomplished for a debut". Erlewine praised Knopfler's "spare, tasteful guitar lines and his husky warbling" and his "inclination toward Dylanesque imagery, which enhances the smoky, low-key atmosphere of the album." In his review for Rolling Stone magazine, Ken Tucker wrote that the band "plays tight, spare mixtures of rock, folk and country music with a serene spirit and witty irony. It's almost as if they were aware that their forte has nothing to do with what's currently happening in the industry, but couldn't care less." Tucker singled out "Sultans of Swing" for its "inescapable hook" and "Bob Dylan-like snarl in its vocal". He also praised "Setting Me Up" as a "heavenly number, funny and bitter." The original album contained a slightly shorter version of "Sultans of Swing", omitting the last seconds of the guitar solo at the end of the song. The full-length version was included on the remastered edition of the album. Cassette versions of the album often featured the sides in reverse order from the original vinyl album—side A consisting of tracks 6–9 and side B consisting of 1–5. The French issue of the cassette had "Down to the Waterline" and "Wild West End" interchanged in the order listed above to allow for more equal playing time on each side. Dire Straits spent 132 weeks in the UK Albums Chart. In Australia, the album was the tenth best-selling album of 1978. ^ Knopfler's 1938 National Style O 14 fret guitar—a legendary guitar used for the Brothers in Arms cover artwork—is a 1937 model and was purchased in the early 1970s from Steve Phillips. Knopfler has used it on all Dire Straits albums and on all of his solo albums. ^ a b All Music Guide: The Definitive Guide to Popular Music (4th ed.). Hal Leonard Corporation. 2001. p. 120. ISBN 0879309237. ^ "Dire Straits". Discogs. Retrieved 4 December 2012. ^ a b c d e "Dire Straits Biography". Musician Guide. Retrieved 2 February 2010. ^ "National Style O". Mark Knopfler Info. Archived from the original on 16 April 2012. Retrieved 4 December 2012. ^ "Dire Straits". Dutch Charts. Retrieved 17 August 2011. ^ "30 years of Dire Straits!". 16 January 2010. Archived from the original on 9 March 2010. Retrieved 3 February 2010. ^ a b "Dire Straits tour 1978". Mark Knopfler Info. Archived from the original on 4 September 2012. Retrieved 4 December 2012. ^ a b c Erlewine, Stephen Thomas. "Dire Straits". AllMusic. Retrieved 4 December 2012. ^ a b c d Tucker, Ken (25 January 1979). "Dire Straits". Rolling Stone. Retrieved 4 December 2012. ^ Jones, Curtis (2019). "The Daily Vault Music Reviews : Dire Straits". dailyvault.com. Retrieved 29 January 2019. ^ Dire Straits (booklet). Dire Straits. Burbank, California: Warner Bros. Records. 1978. pp. 11–12. 947769-2. ^ "Dire Straits - Albums". Official Charts. Retrieved 21 August 2018. ^ "Dire Straits - Dire Straits". Austriancharts.at. Retrieved 21 August 2018. ^ "Dire Straits - Communique". Offizielle Deutsche Charts. Retrieved 21 August 2018. ^ "Hits of the World - Spain". Billboard. Nielsen Business Media, Inc. 21 July 1979. p. 69. Retrieved 29 September 2017. ^ "Canadian album certifications – Dire Straits – Dire Straits". Music Canada. ^ "Gold-/Platin-Datenbank (Dire Straits; 'Dire Straits')" (in German). Bundesverband Musikindustrie. ^ "Italian album certifications – Dire Straits – Dire Straits" (in Italian). Federazione Industria Musicale Italiana. Select "2015" in the "Anno" drop-down menu. Select "Dire Straits" in the "Filtra" field. Select "Album e Compilation" under "Sezione". ^ "Dutch album certifications – Dire Straits – Dire Straits" (in Dutch). Nederlandse Vereniging van Producenten en Importeurs van beeld- en geluidsdragers. Enter Dire Straits in the "Artiest of titel" box. ^ "The Official Swiss Charts and Music Community: Awards (Dire Straits; 'Dire Straits')". IFPI Switzerland. Hung Medien. ^ "British album certifications – Dire Straits – Dire Straits". British Phonographic Industry. Select albums in the Format field. Select Platinum in the Certification field. Type Dire Straits in the "Search BPI Awards" field and then press Enter. ^ "American album certifications – Dire Straits – Dire Straits". Recording Industry Association of America. If necessary, click Advanced, then click Format, then select Album, then click SEARCH. "Water of Love" / "Down to the Waterline"
This page was last edited on 17 March 2019, at 18:53 (UTC).